Children living in homeless shelters and supportive housing have limited options for summer fun. 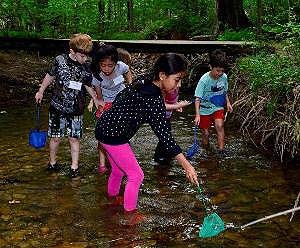 The Fairfax County Park Authority, looking to expand these options, provides eligible children with free summer camp opportunities. Since 1997, PACT in partnership with the county's homeless shelters and generous private sector sponsors, has provided summer fun and education for more than 745 children, ages 6 to 17. PACT successfully integrates children from local shelters into Park Authority camp programs. Partners include Family PASS, Homestretch, FCPA, Shelter House, Safe Places, FACETS, FCPS Homeless Intervention & Resources, and Good Shepherd Housing. These organizations have come to depend on this program during the summer months for children and their parents. The benefits of this camp experience go beyond the wonderful adventures and nurturing times the children receive. This camp also provides an opportunity for parents to seek employment or learn valuable skills without having to worry about childcare. 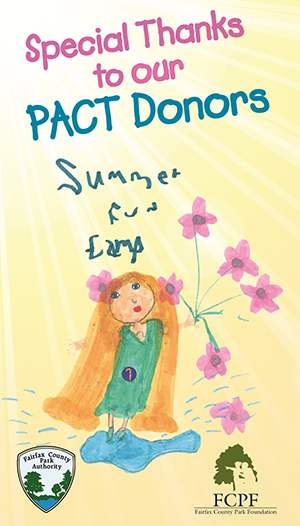 PACT is fully funded through contributions from local businesses, foundations and individual donors. Special appreciation is extended to Fairfax County businesses, foundations and private donors for their philanthropy and support of this worthy program. In 2018, donations from the generous sponsors allowed 49 children to attend 273 weeks of camp and 144 extended care sessions!